Wine glasses that is! Casual Luxury principles denote that the smallest things matter a lot. Anyone who knows me has heard me say, “The devil is in the details.” It is with that in mind, I offer a simple primer on how the size and shape of glassware affect the taste of your beverage — and thanks to the folks at Cardinal Glass for the beautiful glassware and glassware etiquette advice. Red Wine: Red wine glasses should be deep and either slightly elongated or balloon shaped. This helps the wine aerate and focus the aromas upward. In effect, the shape concentrates the flavors and aromas to maximize their potential. Red wines are commonly served at room temperature or slightly cooler. Serving red wine too warm can overwhelm the senses and will not bring out the best in your bottle. 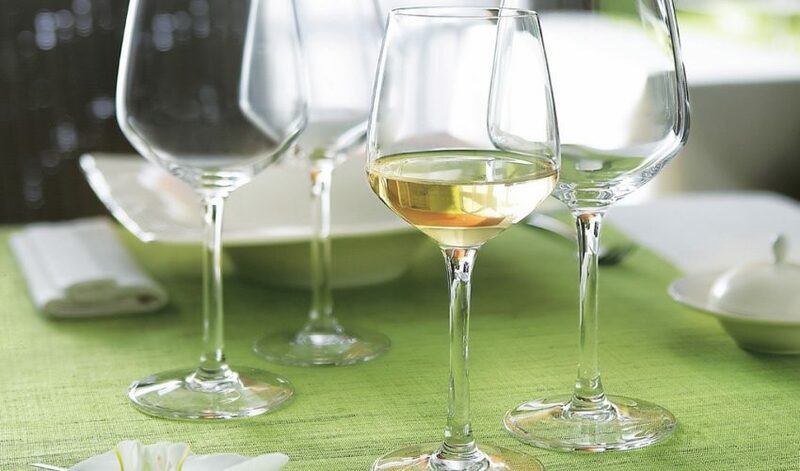 White Wine: The bowl of a wine glass is more elongated than the red wine glass. The narrow shaped bowl helps balance white wine’s fruit forward nature. It also helps intensify the crisp finish. Some white wine glasses are flared at the rim. The flaring design is perfect for especially young white wines, as it helps further intensify the finish. White wine should be served chilled, but not icy. Sparkling Wine: Sparkling wine is any wine infused with bubbles. There are many kinds of sparkling wine. Champagne is from the Champagne region of France. Prosecco is an Italian sparkler. Cava is from Spain. There are also great California sparkling wines that use the Champagne method to create their bubbly. Glasses for this wine are long and slender. The shape preserves the fine bubbles and focuses the delicate aroma. Sparkling wines are served chilled to very cold. Specialty: There are many other shapes of glasses that you can find. Each one has its own unique form designed to improve the experience and enjoyment of the beverage. In my opinion, whichever drink you like is the best drink. Be sure to pick up different shaped glasses that put your favorites in the best light possible. I find tag sales are a great place to get a mix of glasses, and it’s always nice to reduce, reuse and recycle by giving them a new home in your bar.